Following the success of last year’s Upcycle and Repair Fair when we tackled furniture, bikes and jewellery, this year we will be adding electricals and electronics. Bring along your tired toasters, lazy laptops, kaput kettles, faulty fans, duff DSLRs, in fact anything with a mains plug or a battery, and we’ll see what we can do. This is not simply a free repair but rather we hope you will participate in the fix, learn what went wrong, and maybe even learn how to fix it yourself another time. Please make sure you bring whatever mains leads, batteries or accessories are needed to demonstrate the fault. We will not have spare parts available but if you bring the right ones we can probably help you fit them. If you would like to volunteer as a fixer, whatever your range and level of skills, then please join our group here on Restarters.net and add your skills to your profile. This event is part of St Albans SustFest 2019 running from 11th May – 1st June 2019. As part of St Albans’ Sustainability Festival, St Luke’s held an Upcycle & Repair Fair n 2018. 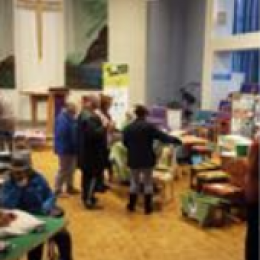 This was a great success involving many local community groups and showcasing everything from upcycled furniture to bicycle and jewellery repairs. Our Upcycle and Repair Fair in 2019 will be on Saturday 18th May. Please join this group if you'd like to fix with us. You don't need to be a St Luke's member, or indeed have any church affiliation. St Luke's Church is three quarters of a mile from St Albans City Station, served by frequent Thameslink trains from St Pancras. The No 84 bus passes the church on its route between the City Centre, St Albans City Station and New Barnet Station, running roughly every 20 minutes. If you are driving you can park (discretely) in the residential roads around. If you're unfamiliar with the area, for easy navigation you could try Barncroft Way, from which there is a short footpath through to Cell Barnes Lane close to the church.